Loreto, Mexico is an hour and a half flight from LAX on Alaskan Air; the half hour drive from the airport to Villa del Palmar Resort & Spa at the islands of Loreto is breathtakingly beautiful; the natural beauty of the surrounding Giganta Mountains, and the sweeping views of the Sea of Cortez, is staggering. Scruffy desert bushes, in all sizes and shapes, grow along the winding road, and gigantic cactus, some as tall as 97 feet high, rise from crevices in the surreal mystical mountains … no doubt, as the 5th largest area on the planet for cave paintings, their sculpted peaks hold many secrets. Legend has it, the transformed energy and spirits of giants who once inhabited the earth now live inside the cactus, reigning over sacred grounds that have been home to many nomadic tribes. Once at the property, our van passes through a security gate. With great thought in its planning and respect for the environment, Villa del Palmar, on the edge of the second largest sea park in the world, offers guests a wealth of nature to discover, explore and enjoy. Rising from the desert like a phoenix; its low adobe buildings blend into the terrain with the composition and compassion of a landscape masterpiece. My luxury suite has a fully stocked kitchen; sliding doors in the bedroom and living room, open onto a large terrace that looks out on the resorts three swimming pools and the islands of Loreto. This all- inclusive family friendly resort offers a wide range of daily activities and entertainment for all ages: from adult aerobics in the main pool and kid’s yoga on the beach, to BBQ’s by the sea and a wide range of water sports like kayaking, paddle boarding, snorkeling and fishing. There are three restaurants to choose from (each has its own chef). The property is ideal for a romantic getaway; it’s a golfer’s paradise, and thanks to a nurturing spa, a perfect wellness retreat. 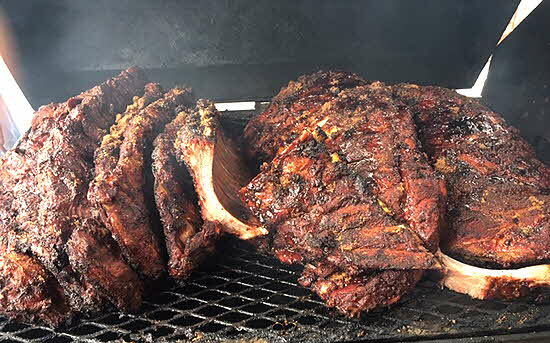 We arrive on a day when a BBQ bash is on the schedule of evening activities. At 7, I wander down to the beach; festivities are underway; a fire dancer has the crowd mesmerized; a variety of meats, seafood, salads and vegetables are on the grill; the MC leads guests into a dancing frenzy… from salsa to ABBA’s “Dancing Queen”. When the activities settle down, we gather around one of the bonfire pits to star gaze late into the night. Lunch in Casa Mia the next day is a pizza party; we munch on their famous thin crusted pizzas, oozing with grilled meats, cheeses and chicken, that are made with corn meal rather than flour. At night we dine in Danzante, the resort’s fine dining restaurant. A special feast has been prepared to titillate our taste buds: shrimp wrapped in a sweet spicy sauce, tortilla soup perfumed with pumpkin flower and guajillo chili, locally caught sea bass from the nearby fishing village of Ensenada Blanca… served with vegetable, mushroom and Parmesan risotto, and filet mignon in merlot and red passion fruit sauce, rosemary potatoes and asparagus wrapped in bacon. Tart and frothy margaritas compliment the menu and quench our thirst. 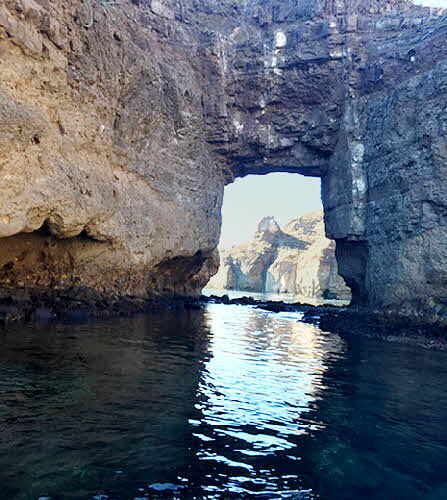 The next morning, after a delicious buffet breakfast in the Market Restaurant, we wade into the shallow calm water of the Sea of Cortez and climb aboard a boat for an exciting day of discovery and snorkeling. The sun is rising higher in the sky; I feel the warmth chasing the earlier chill; it is the beginning of winter here on the Baja Peninsula. We pass dramatic formations, craggy rocks inhabited by hundreds of sea birds, and intriguing caves ablaze with colorful wall paintings. We anchor off the island of Carmen; don snorkel masks and flippers, and then jump into the refreshing clear water. I am overwhelmed by the schools of fish that swim by my side. The island of Carmen, once housed 3,000 people and a thriving salt industry. Today, it’s a breeding habitat for Longhorn Sheep and a favorite hunting destination for those who can afford the bargain price of $79,000 for a week of challenges. 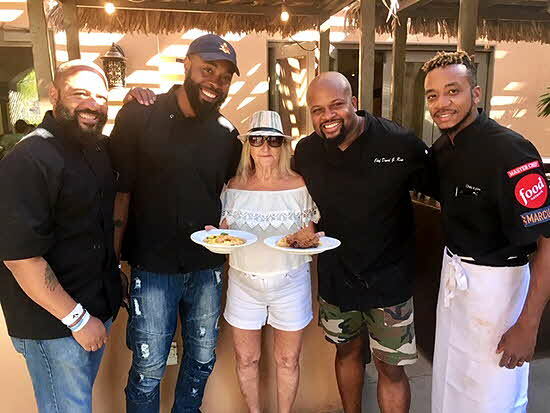 As part of the hotel’s culinary calendar, visiting Chef Dave Love and his team from the States, entertains guests with a poolside lesson in cooking fried green tomatoes. 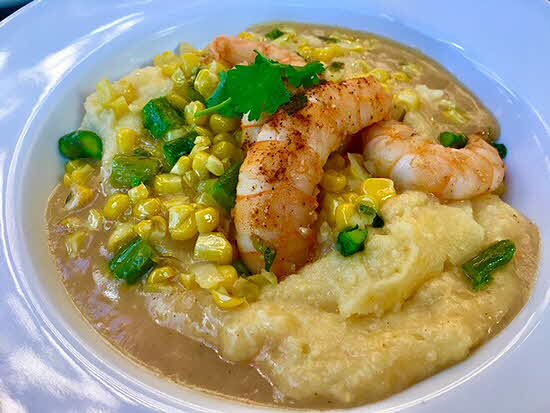 Then on Sunday, they prepare two special dishes for brunch: creamy cheesy shrimp and grits and buttermilk fried chicken on cheddar and chive waffles, drizzled with bourbon maple syrup. 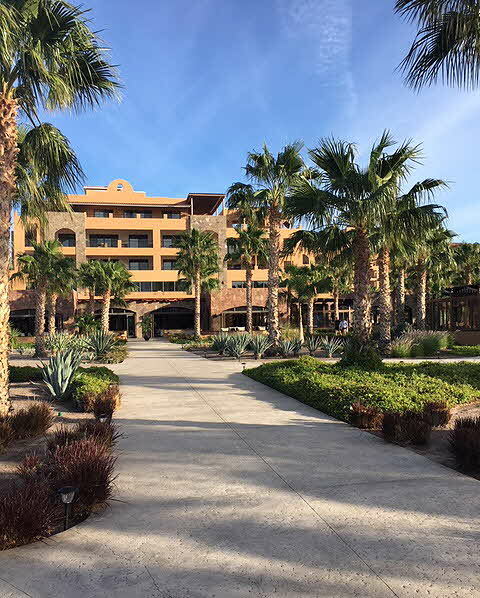 Oscar Torres, Food & Beverage Manager, tells me: “In order to please our guests, we think about the environment, the weather and people coming here. As habits change with our younger guests, we are ready for the growing tendencies towards vegan additions to our menus. Because we cook from base, we can manage flavors and correct our recipes as ordered; we keep it simple with a wide range of flavors and choices. All resorts give you basic amenities; the only thing we can do differently is to recognize and remember what pleases our guests when they return. Service is free so we offer the best. Passion motivates our service. We want people to leave happy with a smile on their face”. Brad Myrick, Director of Golf Operations, drives me around the Rees Jones 18-holecourse and nine hole putting green, briefing me on the course’s unique characteristics, subtle topography changes and connection to nature. 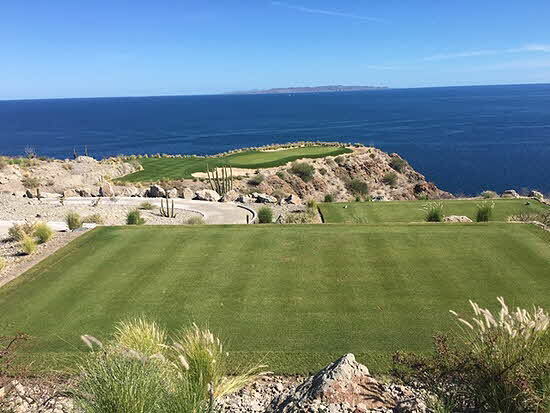 Encircled by a natural park, the setting is stunning and inspiring with its backdrop of mountains, sand dunes, panoramic views of the Sea of Cortez, natural vegetation, and its dramatic signature 17th hole. He tells me: “this is a perfect golf course; it has finesse, subtle slopes and is course friendly for all ability levels”. Not being a golfer, I learn that “walk behinds” are the mowers that tend the grass. Carlos Velasco, who oversees the hotel’s tours and activities, shares a wealth of folklore and history. “In colonial times, missionaries were sent here to spread Christianity among the original indigenous peoples. California was a mystical place for 1,000 years. When Herman Cortes landed in La Paz, he found tribes of pearl hunters. The Loreto Mission in the town of Loreto is the mother of all California missions, serving 25 different culture classes. Mexicans were allowed to sit inside the church; Indians sat in the atrium”. Carlos arranges for the shuttle to take me to town; I visit the mission, wander the cobblestone streets, and then stop at Mi Loreto Restaurant for a heaping bowl of guacamole. The spa is all about wellness; it is a sanctuary of remembrance. Spa Director Claudine Riemer welcomes me with a calming aura. I follow Adela, the bath lady, into the elevator to the second floor; shed my clothes and don a robe. There is time before my 90 minutes massage to immerse my body and clear my mind in a series of hot, warm and cold pools. While I relax and luxuriate in each, she places cold cucumber rounds on my eyes and covers them with a cold towel. In between dips, and to continue the process of opening and closing my pores to flush out toxins, I hit the sauna, steam room and icy Vichy shower. Little did I know there was more to come. Adela leads me to a tub filled with Epsom salts for a ten minutes soak, and then to another filled with fresh cut aloe; I rub slices of aloe over my body and face. When I emerge from this final ritual, I am ready to take on the world, but before I do, I move to a message room where the knowing hands of a therapist transports me to yet another state of bliss. On Sunday evening I join Anna Claudia, the executive chef of Danzante. She tells me “I found what I love to do here. 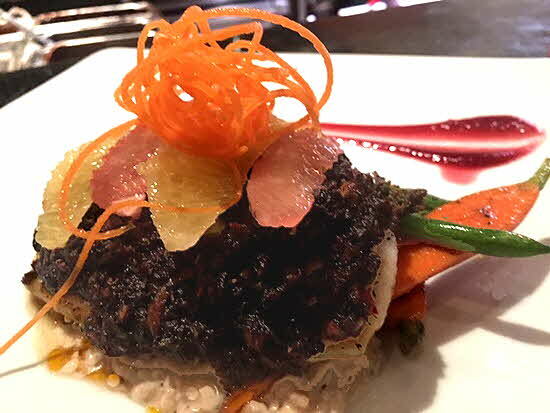 I like to put my special touch on every dish I create, and be remembered for the changes I make working with layered and textured flavors, combining chipotle with sweet sauces”. She is proud to serve me one of her favorites: lamb chops in chipotle sweet sauce and bacon wrapped scallops… a fitting feast for my “last supper”. 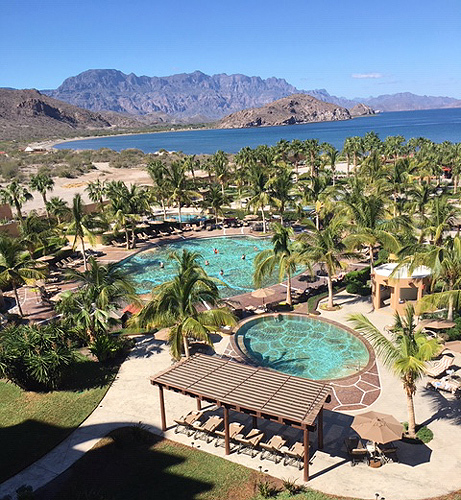 Villa Del Palmar Resort and Spa at the Islands of Loreto is a congenial low- key calming retreat in the middle of the desert, a place where luxury is in harmony with nature. Poised for expansion, it is an ambitious project under the baton of its co-owners and COO Paul Moreno. The blueprint includes construction of a fractional ownership hotel and the sale of lots for private homes… with the commitment to preserve the integrity pf this very special paradise. What sets this property apart from other resorts for me is the personalized service; those who treated me like family are waiting to remember me when I return. The Villa Group owns and manages a collection of all-inclusive Luxury Resorts & Spas in Mexico: Cabos San Lucas, Puerto Vallarta, Nayarit, Cancun and Loreto Islands. Time share ownership is available.